Just a month and a half ago, Ryan Callahan and the New York Rangers were in a bit of a stand off. Both sides found themselves disagreeing on the terms of Callahan's new contract. However, the day before the Rangers and Callahan were set to go to arbitration, they came to terms on a three year deal worth nearly $13 million. Fast forward to today, when Callahan was named the Captain of the Rangers. His alternate captains being Brad Richards and Marc Staal. 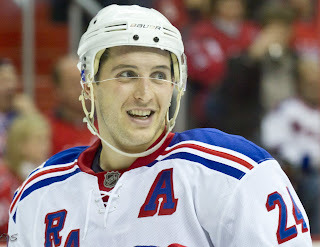 Callahan, a New York native, was drafted by the Rangers in the fourth round (127th overall) of the 2004 NHL Entry Draft. Since coming into the league during the '06-'07 season, Callahan has scored 76 goals, tallied 144 points, and played in 284 games, all with the Rangers. In an interview with Dan Rosen of NHL.com, shortly after being named captain, Callahan said, "I started from draft picks doing the prospects camps and Traverse City, and looking back on all that now being named captain, it's a little bit of a surreal feeling." This move is exactly what the Blue Shirts needed. After buying out Chris Drury's contract, a sizable hole was left in the team leadership category. That void should no longer exist with Callahan wearing the "C". After former captain, Drury, missed most of last season due to injury, Callahan, along with Staal as the alternative captains were relied upon to lead the team. So going into this situation should be nothing new to Callahan and the Rangers. Callahan already has the respect of his teammates because of his actions and leadership on and off the ice. In only 60 games last season Callahan unleashed 224 hits, blocked 77 shots, stole the puck 42 times, and averaged just under 20 minutes of ice time a game. If that is not a player who gives his team everything he has got than I don't know what is.